Governors State University encourages applications from qualified students of all cultural, racial, religious, and ethnic groups. Admissions process will vary for first year undergraduate students, transfer students, master's or doctoral candidates, international students, veterans or certificate program students applying for admission. Details on the application process are available via the GSU Admissions website at http://www.govst.edu/Admissions/. Apply online at www.govst.edu/apply and locate other information needed for admission to the university may be obtained by visiting the admission's website address at http://www.govst.edu/Admissions. Admission documents sent in support of applications are not returnable or transferable. Veterans who have completed 45 credit hours of college credit may apply to Governors State University. The application fee will be waived upon receipt of an application accompanied by a copy of the form DD 214. Applications, transcripts, and other documentation can be mailed or dropped off in the Office of the Coordinator for Veterans and Military Personnel. This classification is for students who are currently attending high school or have graduated from high school but never attended college or have earned less than 24 semester hours from a regionally accredited institution. Special consideration will be applied when considering military veteran, international student, home school student, and GED earner applicants. Applicants are required to submit official high school transcript(s) and official ACT or SAT score reports (if younger than 21 years old), or official GED. Final high school transcripts must be submitted after graduating or freshman applicants will be unable to begin courses. *Freshman admits are required to participate in a unique learning community that requires full time attendance with coursework largely taking place between 8:00 a.m. and 6:00 p.m. Monday-Friday. All freshman are admitted for the fall and spring semesters. Applicants must submit a non-refundable $25 application fee. To apply: Submit an application, the application fee, official high school transcript(s), official test scores, and official college/university transcripts (if applicable), which demonstrate meeting criteria 1-3 above directly to the Office of Admission and Student Recruitment. Deadlines: Students are strongly encouraged to apply by the early decision deadline of November 1. After November 1 applications are considered on a rolling basis until April 1st or until the freshman class is filled. This classification is for students who declare an undergraduate major, including those seeking a second bachelor's degree (Note: second bachelor's degree-seeking students will be assessed graduate tuition and fees.) Transfer students who have earned less than 24 semester hours of college credit will be admitted as freshman. have satisfied any collegial and/or major criteria, if applicable, for undergraduate study in a specific major. To apply: Submit an application, the application fee, credentials, and official transcripts from all colleges/universities attended, which demonstrate meeting criteria 1-5 above directly to the Office of Admission and Student Recruitment. Deadlines: Most programs are on a rolling admission basis. Students are strongly encouraged to apply early. The majors listed below have special admission criteria beyond the general university requirements. Requirements could include additional materials and/or application deadlines. Please refer to the specific major sections within the Academic Degree Programs Offered section for the criteria and deadlines. This classification is for students who declare a master's degree, including those seeking a second master's degree. have satisfied collegial and/or major criteria, if applicable, for graduate study in a specific major. Applicants must submit a non-refundable $50 application fee. To apply: Submit an application, the application fee, credentials, and official transcripts from all colleges/universities attended, which demonstrate meeting criteria 1-3 above to the Office of Admission and Student Recruitment. Deadlines: Most programs are on a rolling admission basis. However, the following programs have admission deadlines or limited admission periods: Communication and Training, Communication Disorders, Counseling, Criminal Justice, Educational Administration, Health Administration, Occupational Therapy, Psychology, and Social Work. Refer to the specific major sections in this catalog for criteria and deadlines. The majors listed below have special admission criteria beyond the general university requirements. This could include additional materials and/or application deadlines. Please refer to the specific major sections within the Academic Degree Programs Offered section for criteria and deadlines. This classification is for students who declare a doctoral degree. Governors State University doctoral programs have varied requirements for admission. Programs may have specific deadlines for the submission of applications and required materials. Contact the appropriate department/division for specific application forms and admission requirements. Applicants must submit a non-refundable $75 application fee. To apply: Submit an application, the application fee, credentials, program application fees, and official transcripts from all colleges/universities attended to the Office of Admission and Student Recruitment. Deadlines: Please refer to the specific major sections in this catalog for criteria and deadlines. Tranfer students who have not completed a bachelor's degree from any college or university, have earned 24-59 semester hours, and who have not declared an undergraduate major, but plan to do so by their junior year may fit in this category. if after earning a total 60 semester hours (or 90 quarter hours) and have not been admitted to a major will automatically be converted to non-degree seeking and no longer eligible for financial aid. To apply: Submit an application, the application fee, credentials, and official transcripts from all colleges/universities attended, which demonstrate meeting criteria 1and 2 above directly to the Office of Admission and Student Recruitment. Transfer students who have not completed a bachelor's degree from any college or university, have earned 60 semester hours (or 90 quarter hours) or more of college level coursework, and who have not declared an undergraduate major may fit in this category. if after registering for 18 credit-hours and have not been admitted to a major will automatically be converted to non-degree seeking. Course work completed in this status may or may not be applicable to a major, subject to approval by the advisor and appropriate dean. To apply: Submit an application, the application fee, credentials, and official transcripts from all colleges/universities attended, which demonstrate meeting criteria 1-3 above directly to the Office of Admission and Student Recruitment. Students who have not completed a bachelor's degree from any college or university and who do not intend to earn a degree may fit into this category. Course work completed as a non-degree seeking student is not applicable to any degree offered by GSU, except by written exception by the dean of the appropriate college. Students in this classification are not eligible for university administered financial aid. Applicants must submit the non-refundable $25 application fee. have earned a high school diploma or GED equivalent. Students admitted as Undergraduate Non-Degree Seeking Students must re-apply to Governors State University if they wish to change their status to Degree Seeking. Students with bachelor's or higher degrees from a regionally-accredited institution who do not intend to earn a degree at Governors State may fit this category. Coursework completed as a non-degree seeking student does not automatically apply to a degree program. The application of such courses to degree requirements is governed by the policies established by the University and the dean and faculty of each college in effect at the time of admission to a degree program. No more than six (6) credit hours earned while in non-degree status may be applied toward the requirements of any graduate degree program. Transfer of credits earned in non-degree seeking status to a degree program requires approval of the appropriate academic dean. Applicants must submit a $25 non-refundable application fee. Non-degree seeking students are not eligible for University-administered financial aid. 1. have earned a bachelor's or graduate degree from a regionally accredited institution. 2. have been in good standing at their last institution attended. Students admitted as Graduate Non-Degree Seeking Students must re-apply to Governors State University if they wish to change their status to Degree Seeking. have satisfied any applicable collegial and/or major admission criteria for the certificate program for which they are applying. Refer to the information related to specific major areas of interest in this catalog for special collegial and/or major admission criteria and additional credentials which may be required. Graduate-level student applicants must submit a non-refundable $50 application fee. To apply: Submit an application, the appropriate application fee, credentials, and official transcripts from the post-secondary institution, which demonstrate meeting criteria 1-3, to the Office of Admission and Student Recruitment. The certificate programs listed on Academic Degree Programs Offered have special admission criteria beyond the general university requirements. This could include additional materials and/or application deadlines. Refer to the specific certificate sections in this catalog for the criteria and deadlines of contact the appropriate department/division for specific admission information. who has applied for a change of status to become a permanent resident of the United States but has not been issued an alien registration card effective as of the date classes begin for the semester in which they are enrolled. Please see Additional Information. International students are eligible for admission to degree programs but may only be admitted as non-degree seeking students if pursuing a degree at another institution. That institution must provide written verification of enrollment in a degree program. GSU is authorized under federal law to sponsor nonimmigrant alien students studying on an F-1 visa or J-1 visa. Applicants on F-1 or J-1 visas, or any other temporary visas, are not eligible to be classified as residents of the State of Illinois for tuition purposes, regardless of actual length of residence in the State of Illinois, unless otherwise authorized by The Office of the Registrar and The Office of International Services. The applicant on an F-1 student or J-1 student visa must plan to pursue a full-time program of academic study at Governors State University (6 credit-hours per term for doctoral students, 9 credit-hours per term for master's degree students, and 12 credit-hours for undergraduate students). All transcripts, letters, financial documents and other admission material become the property of GSU. NOTE: Governors State University requires that all F-1 and J-1 students have health insurance that meets the U.S. Department of State standards. provide evidence of financial support to meet all financial needs for the duration of their studies at GSU, such as: an affidavit of financial support and an original financial document, such as a bank statement, with evidence of sufficient liquid assets. An application for admission as a degree-seeking student. The application may be submitted online previous to mailing in the documents or a paper copy may be included in the application packet. college or university transcripts, if applicable. Official TOEFL, IELTS, OR PTE score report or evidence of completion of ELS level 112. Evidence that adequate funds are available to meet all financial needs for the duration of studies at Governors State University. NOTE: Applicants must submit an evaluation of academic credentials. Official foreign credentials must be evaluated by Educational Credential Evaluators (ECE) in Milwaukee, Wisconsin or by any other NACES (National Association of Credential Evaluation Services) member organization. Applicants who would like transfer credit for prior coursework should request a "course-by-course" evaluation report. Applicants who are seeking graduate program admission with no transfer credit should request a "general" evaluation report. For more information, please contact the Office of International Services at 708.235.7611. Applicants must provide any required additional special admission credentials for the desired major. Refer to other sections of this catalog for any necessary special admission requirements. Applicants to an undergraduate program must submit a non- refundable $25 application fee. Applicants to a master's program must submit a nonrefundable $50 application fee. Applicants to a doctoral program must submit a $75 non-refundable application fee. F-1 visa students who wish to transfer to Governors State University must submit a copy of the current school I-20 form, transcript, and a letter from the current school showing dates of enrollment and eligibility to transfer. The Office of International Services is available to assist students with the visa application process. Additional information is available on the Office of International Services (OIS) website at www.govst.edu/ois. OIS is available to help international students arrange for airport pickup and housing. Many students live in the immediate area or in Chicago and commute either by car, train or university shuttle to Governors State University. For further information and to coordinate the details of your arrival at GSU, please contact the Office of International Services at ois@govst.edu. A student may defer his or her admission/enrollment one time per admission application, not to exceed one year from the original admission term. For example, if a student applies for Fall 2017 admission, he/she may update his/her admission one time, to a future term as far in the future as Fall 2018. International students are allowed to defer their enrollment twice per admission application, not to exceed one year from the original term of application. After one year, a new admission application and application fee is required. is seeking a level change, i.e., from undergraduate to graduate status or from graduate to undergraduate status. Students are subject to the continuing student status policy, with the exception of students enrolled in accredited programs where accreditation requirements would prohibit reactivation of a student's active level. Students whose enrollment is interrupted for three or more consecutive terms must contact their advisor to be reactivated before enrollment, with the exception of students enrolled in accredited programs where accreditation requirements would prohibit reactivation of a student's active status. Any student whose enrollment is interrupted for five or more years (15 or more consecutive terms) must reapply through the Office of Admission and Student Recruitment and will be subject to any new admission and curricular requirements. With regard to certain accredited programs, the reactivation of a student's status is determined on a program basis. Occupational Therapy requires that students who have not been enrolled for one year (three consecutive terms, including Summer) must apply for readmission to the M.O.T. program. Bachelor and Master of Social Work require that students who have not been enrolled for three years (nine consecutive terms, including Summer) must apply for readmission to the appropriate B.S.W. or M.S.W. program. Master of Arts in Counseling requires that students who have not been enrolled for more than one year (four consecutive terms, including Summer) must apply for readmission to the Counseling program. Doctorate of Physical Therapy requires that students who have not been enrolled for more than one year (four consecutive terms, including Summer) must apply for readmission to the D.P.T. program. Readmission and Special Admission provide for the possible petition for readmission by students, who left on academic probation or who were suspended from the university. The policy also provides for cases of special admission requested by applicants who do not meet the published criteria for admission. All readmissions involving students who left the university while on academic probation or those suspended from Governors State University and all special admission cases (defined herein) shall be considered by the University Committee on Readmissions and Special Admissions. The committee shall make recommendations to the appropriate division or department chairperson or director, who will make the final decision with input from the program faculty. The policies on readmissions appear in the Appendix . Additional information regarding special admission opportunities and petitions for admission are available from the Office of Admission and Student Recruitment or on its website at www.govst.edu/admission. Under special agreement between Governors State University and area community colleges, students may be eligible to participate in a Dual Degree Program. Area community colleges include City Colleges of Chicago, College of DuPage, Harper College, Joliet Junior College, Kankakee Community College, Moraine Valley Community College, Morton College, Prairie State College, South Suburban College, Triton College and Waubonsee Community College. Dual Degree Program students complete their Associate degree at a partner community college and transfer to GSU for their upper-division courses to complete in their Bachelor's degree program. Students who are interested in participating in the Dual Degree Program are encouraged to contact their counselor at their community college. The benefits of the Dual Degree Program include working closely with advisors from both institutions, participating in student life at both institutions, and specific tuition and scholarship opportunities. Dual Degree Program students are provided with the services from both institutions to help ensure that they make a seamless transition from their community college to Governors State University. For more information, please contact Jessica Specht, Director of Dual Degree Program, at 708.534.4494 or go to www.govst.edu/dualdegree. The university wishes to ensure that applicants have attained sufficient mastery of the English language necessary to achieve academic success. Prior to admission to a degree or certificate program, all applicants who do not hold a previous degree or diploma from an institution where English was the foundational language must provide evidence acceptable to the University of having attained sufficient mastery of the English language. Applicants must attain a minimum acceptable score on the Test of English as a Foreign Language (TOEFL), a minimum acceptable score on the International English Language Testing System (IELTS), a minimum acceptable score on the Pearson Test of English Academic (PTE), or have completed a minimum proficiency level of 112 through ELS Education Services Inc.'s Language Centers. The attainment of a minimum acceptable score on TOEFL or IELTS does not take the place of any special English language proficiency requirements for specific majors or university requirements as stated in this catalog. Implementation and verification of the minimum competencies will be done by the Office of Admissions and the Office of International Services. The university will also consider applications to any degree program for those individuals that are neither citizens nor permanent residents of the United States of America and that will not study at GSU on an F-1 or J-1 student visa. For the TOEFL minimum acceptable scores, see the TOEFL table. For the PTE minimum acceptable scores, see the PTE table or refer to GSU Policy 9. The IELTS minimum acceptable score is 6.0. NOTE: Applicants must submit an evaluation of academic credentials. Official foreign credentials must be evaluated by Educational Credential Evaluators (ECE) in Milwaukee, Wisconsin or by any other NACES (National Association of Credential Evaluation Services) member organization. Applicants who would like transfer credit for prior coursework should request a "course-by-course" evaluation report. Applicants who are seeking graduate program admission with no transfer credit should request a "general" evaluation report. For more information, please contact the International Services at 708.235.7611. Applicants on or seeking F-1 or J-1 visas should refer to the section on international students. Governors State University awards college credit for Advanced Placement (AP) exams with scores of three (3) or higher depending upon the exam. The AP chart below gives information about earned scores and associated credits earned for each examination. Specific questions in regard to how AP credit(s) potentially apply to your selected major must be directed to an Academic Advisor in the student's program of study. If you are a high school student and requested that the College Board send your scores to Governors State University when you took the tests, your scores will be evaluated in early August when GSU receives the score report. If your AP test score meets the requirements for course/elective credit, you will see the appropriate credit posted onto your student record in 8-12 weeks after scores are received by the Admissions Office. Scores of two (2) or one (1) will not be considered for course or elective credit. An AP exam score of three (3) may be considered for credit in some cases as listed on the official GSU AP chart. Scores of four (4) or five (5) will be considered for course or elective credit as listed on the official GSU AP chart. 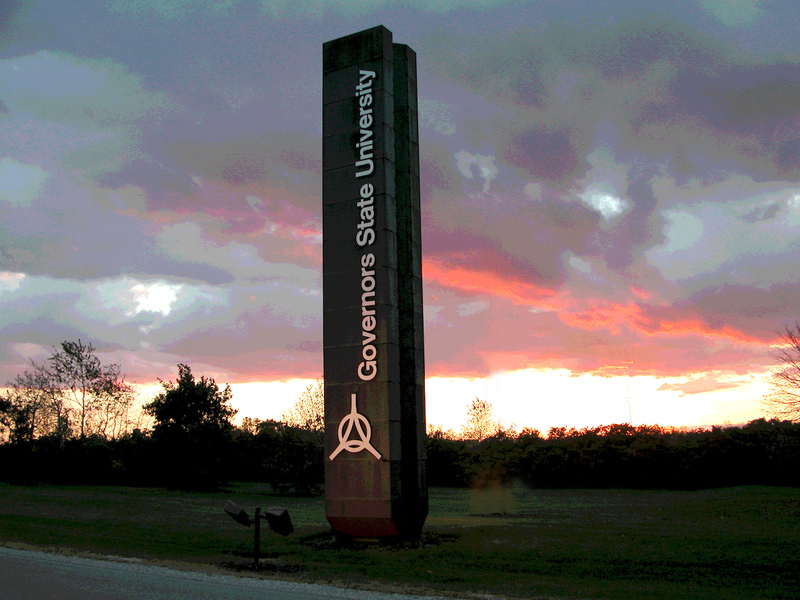 The code number for Governors State University is 0807. If you are a college student transferring to GSU and you took an AP exam in high school, check the AP chart to see if GSU will grant credit for your score. If you want this credit attached to your GSU transcript, contact the College Board. No credit can be posted until a student has enrolled at GSU and official AP scores have been received from the College Board. You can receive college credit for earning acceptable scores on International Baccalaureate (IB) exams. The table below identifies the GSU course equivalencies to IB exam scores. Please see the Admission Counselors or your Academic Advisor if you have questions regarding the identified equivalencies. Governors State University may award credit on the basis of scores earned on the College Level Examination Program (CLEP) and DSST Exams. Students are advised to consult their college and/or advisor for assistance in determining GSU course credit and required scores before taking any CLEP examination. Not all exams will be applicable to all programs and minimum scores are required to receive credit. If you have previously completed a CLEP or DSST exam, you will be required to have the official score report sent directly to GSU. The GSU school code for CLEP testing is 1263. The GSU school code for DSST Exams is 8536. CLEP tests and DSST exams are regularly administered on campus as well by the Testing Center. For further information on CLEP and DSST examinations and exam scheduling, call the GSU Testing Center at (708) 235-7555 or email at testingcenter@govst.edu. You can also view test information at www.govst.edu/testing-center/. Governors State University will award credit to students earning the State Seal of Biliteracy beginning in Fall 2017. Students who present appropriate documentation of the Seal to their advisor within three years of high school graduation will be awarded six hours of foreign language credit. Students are responsible for initiating a review of the Seal. All freshmen admitted to GSU are placed based on their high school grades and scores on the standardized, normed assessment through the admissions process. For math placement, students falling below direct admit criteria will be required to complete math placement assessment. For writing, students falling below direct admit criteria will be required to participate in a writing assessment. All newly admitted and active continuing students who do not have a university hold on their record are eligible to register. Tuition and applicable fees are due as billed by the payment deadline published each term. Maximum Credit-hour Load. Undergraduate and graduate students may register for up to 18 credits for Fall and Spring terms and 12 credits for Summer term. Permission from the college dean is required to exceed these credit-hour maximums. Course Prerequisites and Corequisites. A prerequisite is a course that must be completed before registration in a particular course. A corequisite is a course that is taken at the same time as another course. Several courses have prerequisites and/or corequisites. Students should contact their academic advisors for more information. Continuing Student Status. Continuing students at Governors State University are defined as degree-seeking students whose enrollment at Governors State has not been interrupted for more than five calendar years (15 consecutive terms, including summer terms). This does not include students who have enrolled in accredited programs where accreditation requirements prohibit return to active status following non-enrollment for more than three to 14 consecutive terms. Students in such accredited programs may return only with the program director's permission. Enrollment is defined as registration for one or more credit-hours or audit (noncredit programs/courses are excluded). Degree-seeking students are subject to the curricular requirements in effect at the time of their initial admission and who maintain active continuing student status. Degree-seeking students who lose continuing status must reapply and be readmitted. They will be subject to the admission and curricular requirements of the university, college, and specific major in effect at the time of readmission. Add and Drop. Students may add and/or drop courses any time during the published periods without penalty. See the online course schedule for registration period details. Full time Student Status. An undergraduate student is considered to be enrolled full time for any given term if he or she is enrolled in 12 credit hours for that term. A graduate student at the master's level is considered to be enrolled full time for any given term if he or she is enrolled in nine credit hours for that term. A graduate student at the doctoral level is considered to be enrolled full time for a given term if he or she is enrolled in six credit hours for the term. Students must register at least 14 days prior to the beginning of each fall and spring semester in order to avoid late registration charges. Exceptions include students who are in the first semester of enrollment at Governors State University and students who are adding courses to an established schedule. The Illinois Articulation Initiative (IAI) is a statewide initiative designed to allow students to transfer easily from one college/university to another. Governors State University is a participating receiving university. The Illinois Articulation Initiative has established a General Education Core Curriculum (GECC), which is the statewide transfer general education curriculum common to all IAI member institutions. Governors State University accepts all courses in this curriculum toward its general education requirements. Students may, however, transfer to GSU without completing the GECC. Even though not included in IAI, students may also transfer credits from an out-of-state institution. In order to ease transfer for Illinois students, GSU has used the IAI designations whenever possible. This is not to limit the transferability of courses but to ensure the transfer of courses which carry the IAI designation. Comparable courses from out-of-state institutions (not bearing the IAI designation) may be accepted for transfer. For more information on the IAI, see the IAI website at www.itransfer.org. To minimize transfer problems for students, Governors State University and area community colleges have developed articulation agreements that help students plan bachelor's degree programs beginning at the community college and finishing at Governors State University. These agreements assure smooth transition from lower-division study to upper-division study and completion of a bachelor's degree. For more information on articulation, see the website at www.govst.edu/apply.